I still remember that night many years ago when I had my first experience of somnambulism, or sleepwalking. I was in the third grade and was living with my godparents while my parents were busy running a Chinese restaurant. The bedroom I slept in in my godparents' house was located in the middle of the hallway, right across from the bathroom. It was a school night, which meant I was snuggled up in bed by 9 PM. As usual, I was knocked out within minutes of lying down. It must have been at least an hour later when I found myself awake (or so I thought) and inside the bathroom brushing my teeth. I remember thinking to myself that I had forgotten to brush my teeth before going to bed (which, let me add, was actually not true), and that I would feel unclean if I did not brush my teeth before getting in bed again. My godmother, who was still awake, peeked through the gap in the doorway and asked me what I was doing. She was confused by my explanation but shrugged. Once I finished brushing my teeth, I climbed back into bed and fell asleep. Episodes of somnambulism can range from small movements in bed to walking around, holding conversations, and in some cases even driving--all while asleep. 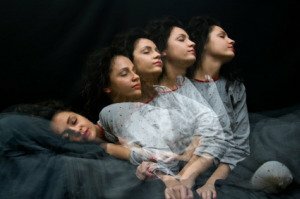 If you are in the 1% to 17% of people who has sleepwalked at least once in your lifetime, you have experienced the unique phenomenon of being asleep with your eyes wide open. In my case, I recalled quite clearly the details of my sleepwalking incident, but this is unusual. Most sleepwalkers are unable to remember having ever moved from bed in the middle of the night. As you will learn in the following paragraphs, somnambulism is categorized as an arousal sleep disorder in the American Psychiatric Association's Diagnostic and Statistical Manual of Mental Disorders (DSM-IV). Read on to learn more about sleepwalking and what you can do to help prevent this bizarre phenomenon from happening to you in a disrupting manner. What Do You Know About Sleepwalking? Do you sleepwalk or have you been around someone who does? Share your sleepwalking stories, questions, and thoughts with us and our visitors. Somnambulism, or sleepwalking, is a sleep disorder that fits into the arousal category of parasomnias. The range of activities that sleepwalkers engage in varies widely in type and complexity. A sleepwalker may do something as simple as sit up in bed, or something as involved as getting out of bed, walking down a flight of stairs, even getting into a vehicle, and driving away! All while still asleep! People have even been known to perform some violent acts during sleep. You can learn more about murders committed while sleepwalking and the trials that followed here. Sleepwalking usually occurs during the third or fourth stages of NREM sleep. This is the time of night when we are in deep, slow-wave sleep. Research has shown that sleepwalking is associated with a lightening of deep sleep to the level of NREM stage 1. Because the NREM portion of the sleep cycle is longest at the beginning of the night (and becomes progressively shorter as the night wears on), sleepwalking is most likely to occur earlier in the night. Episodes typically range from 1 to 5 minutes, although it is not uncommon for episodes to last as long as or even more than an hour. Despite the prevalence of sleepwalking in the population, sleep scientists do not yet entirely understand the physiology associated with this sleep disorder. Remember, as the name of the disorder implies, people who sleepwalk are entirely asleep. They are not easily awakened, and episodes often end spontaneously with the person getting back into bed without ever having woken up. If sleepwalkers do awaken, they will likely be confused and amnesic for the episode. Almost always, people who sleepwalk also sleep talk. While sleepwalking affects mostly children (particularly four to six-year-olds), some adults also experience sleepwalking episodes. In fact, fifteen to 30% of healthy children have experienced a sleepwalking episode before. Luckily, the tendency to sleepwalk normally subsides by the time children reach adolescence. In addition, sleep scientists believe that people who have a family history of somnambulism are more likely to sleepwalk than those who do not. Do you sleepwalk? Share your experiences with us. Factors that induce deep sleep at night are thought to play a role in causing sleepwalking. This is consistent with the observation that, as you learned in the previous section, sleepwalking occurs during the deep slow-wave stages of NREM sleep. Factors that cause more deep sleep (or disrupt it) and predispose an episode of somnambulism include sleep deprivation, depressant medications, internal stimuli such as a full bladder, and external stimuli such as loud noises. The causes of sleepwalking are still poorly understood, but sleep scientists suspect that a neurotransmitter (a fancy name for a chemical that transfers messages between the cells in your body) called serotonin may be involved. This has yet to be confirmed, and more research is necessary to gain a clearer understanding of the causes of somnambulism and of actions we can take to prevent ourselves and loved ones from sleepwalking. In general, sleepwalking is not something you should lose too much sleep over (no pun intended). It usually goes away on its own with age, and there is no evidence suggesting that most people who sleepwalk suffer from emotional or mental problems. Remove dangerous or sharp items such as knives. Lock all doors and windows before going to bed. Invest in heavy curtains for your windows. People have been known to get seriously injured sleepwalking out of a window. If you live in a multiple-story house, have the sleepwalker sleep on the ground floor. Sleeping in an upstairs bedroom increases the chance that you will fall and hurt yourself while sleepwalking down the stairs. If worst comes to worst, medicine such as clonazepam can help raise your arousal threshold (so that internal and external stimuli have to be really intense to arouse you from sleep) and reduce the amount of deep, slow-wave sleep you get each night. But of course, if you think your somnambulism is severe enough to warrant medication, be sure to consult a sleep specialist before taking anything. What should you do if you catch someone sleepwalking? The best thing to do is gently guide him back to bed, avoiding as much physical contact as possible and talking to him or her soothingly. The idea is to try not to wake the sleepwalker up. If sleepwalkers are startled out of their state they are prone to lashing out violently and can hurt themselves and the person responsible for waking them. What is the single best thing you can do to help prevent sleepwalking? Get enough sleep! Sleep deprivation is one of the common causes of sleepwalking and is easily preventable. If you have somnambulism, getting the amount of sleep you need each night can save you from experiencing severe episodes. Do You Have A Sleepwalking Story? Do you have somnambulism? Do you have a story about you or someone else sleepwalking? Share your story, thoughts, and questions with the world by writing in the form below--your insight could aid others who can relate to what you have experienced. Click here to enter your thoughts and see the rest of the form. Click on the links below to read other stories, thoughts, and questions regarding somnambulism. They were all written by other visitors to this page, just like you. My Girlfriend Is Sort Of Sleep Walking? Sleepwalking Only In My Room? Somnambulism Conversation - When Did I Eat Lunch? My Five-year-old Brother Sleepwalks Then Pees!! Sleepwalking Becoming More Frequent For Me? Should I Seek Medical Advice For Sleepwalking? Dement, William. The Stanford Sleep Book. United States of America: 2006. 377-78. Print. Guilleminault, Christian, Luciana Palombini, Rafael Pelayo, and Ronald Chervin. "Sleepwalking and sleep terrors in prepubertal children: what triggers them?" Pediatrics 111. (2003);e17-25. Web. 8 May 2010. Kushida, Clete. "Parasomnias." PSYC 135: Sleep and Dreams. Stanford University. Stanford University, Stanford, CA. 30 Apr 2010. Lecture. Pelayo, Rafael, Kin Yuen, James Winde, and Maria-Cecilia Lopes. Sleep disorders in children. 379-80. Print.